"Be less boring." That's a low bar for us as teachers. However, improvement is implicit in this command. Face it: some days, trying to be slightly less boring is all we have, while on other days, we feel like we could make the study of prairie grasses fascinating to fifth-grade kids. I've been on both ends of the spectrum. Here are three ideas that might help you be less boring. We all know what wait time is -- ask a question and then give students time to think before calling on someone. If we increase wait time from one to three seconds, student responses become 400-800 percent longer, speculative and predictive thinking increase by as much as 700 percent, and low achievers contribute up to 37 percent more. Joseph P. Riley II shares his research about this in "The Effects of Teachers' Wait-Time and Knowledge Comprehension Questioning on Science Achievement." If you're already good at wait time one, try wait time two. Wait time two is the amount of time that you allow after a student's initial answer before speaking or calling on another student. I'm terrible at wait time two. I know this because when I force myself to wait for three seconds after a student responds, my class starts looking around to see what's wrong. If this wait time were typical, then students would be building on one another's answers instead of waiting for me to validate the previous response. Again, we have good intentions for not giving wait time two. We want to encourage the student who has responded, build on it, and bridge to the next concept or question. However, this stops good thinking that might be going on in the classroom and tacitly communicates that teachers are the purveyors of all knowledge. Closing my mouth makes class much more interesting for students and me. The evidence? I hear far more about their thinking. Teachers have a Pavlovian response to hand raising. When we see a hand go up, we want to call on that student. 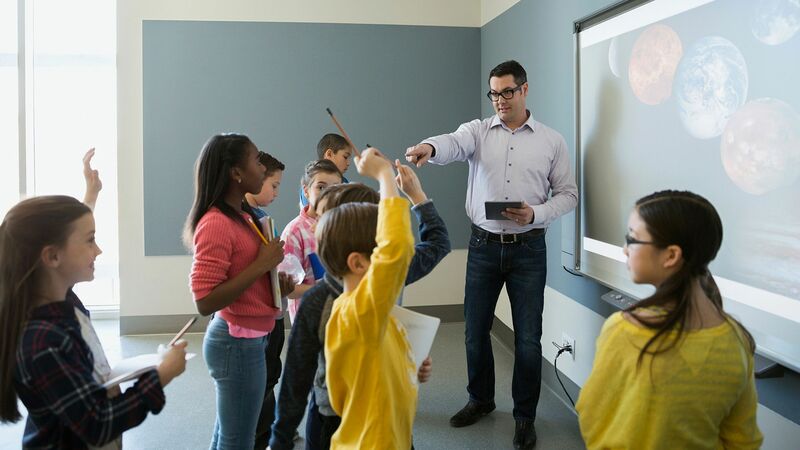 Many of us have learned to fight that urge so that we increase wait time or include other students, but we still struggle with what to do about those students who don't raise their hands. I implemented a policy that required students to signal when they don't want me to call on them. The signal was making eye contact with me and giving me a smile. Anything else (e.g., looking out the window, making eye contact with a friend, scratching a head) was a signal to be called on. This put the onus on unready-to-speak-up students to engage with me while reducing their own anxiety about being called on -- they were already giving me eye contact. In an era of learning walks, instructional rounds, and unannounced observations, this method has another interesting advantage. When my principal would enter the room during any type of whole-class instruction, she would see me asking numerous higher-order questions. Sometimes I overestimated what students would know or be willing to share in these interactions. On two occasions, she complimented my classes for being particularly attentive and engaged because all of them were making eye contact and smiling at me while I asked questions. When she left the room, after a slight delay to ensure that she was out of earshot, my students erupted in laughter because they knew the reason why they looked so engaged -- none of them knew the answers to my overzealous questions! Your enjoyment of teaching is essential to being less boring. I spent a good portion of this past February and March observing in high school classrooms. At least in Midwestern middle and high schools, these months can feel like the educational doldrums. Teaching the same content class after class, year after year, in cold, gray February can be as soul-sucking as a Dementor's kiss. . .
. . . if our focus is on the what rather than the who. Students can be an endless source of entertainment for teachers. The way they understand and apply new concepts is what keeps teaching fresh for me at whatever grade level I'm teaching. When middle school science students ask, "Doesn't organic mean plastic?" or "I thought inertia was a disease," I am fascinated because I'm seeing my teaching through students' clouded eyes. To remain humble and entertained, I have a journal filled with 20 years of fascinating "insights" from the elementary to college students that I've taught. Never lose your sense of humor -- it will make you less boring and is probably essential to maintaining your sanity. Do you have any suggestions for being less boring? I'm certainly interested. Please share in the comments below.